Machine weight: 400 lb approx. Controls Engineering, a proven leader in quality banding equipment design and manufacturing, is proud to bring the Madison Tape Bander. The Madison Tape Bander is designed to quickly move from workstation to workstation and product to product with little to no make-ready between projects and run tape widths from 1” to 3” in a variety of adhesive levels from Repositionable to Permanent to Tamper Evident. Plastic and paper tapes provide all the print and retail marketing benefits of paper bands without the need of heat sealers or ultrasonic welders; meaning higher up-times, lower operating costs and less maintenance. Count on the Madison Tape Bander to bring you better banding solutions. Click here it visit the new Madison Banders site!! Kraft Paper w/Repositionable Adhesive. Creates superior bundle integrity by gripping each carton without causing damage to the carton OR leaving any residue. Clear Plastic w/Repositionable Adhesive. Clear tape allows high-end marketing and product information to show while still providing a secure way to create multi-packs. White Paper w/Repositionable Adhesive. 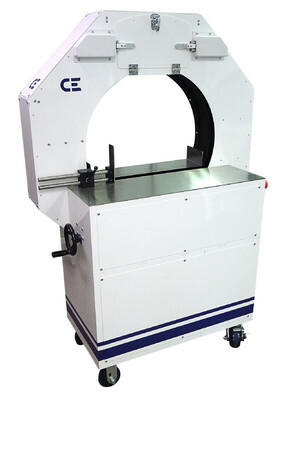 Provides an easy to remove band and lends itself well for printing.